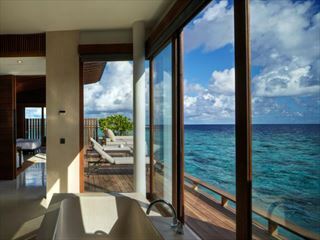 Hidden away on the Maldives’ most exclusive island, Fairmont Maldives is a treasure in the Indian Ocean. 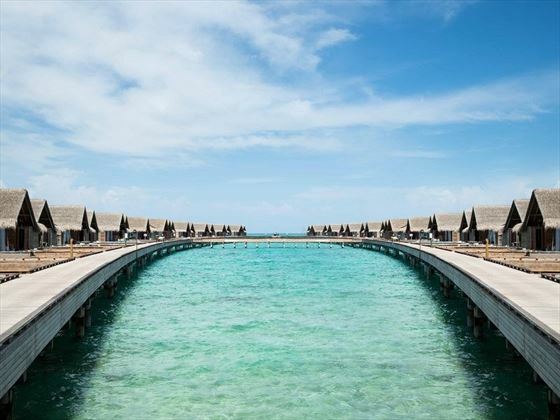 Framed by Sirru Fen Fushi Island’s sparkling white sands and crystal-clear lagoons, the beauty of this place will take your breath away. The accommodation here is clearly inspired by the serenity of the hotel’s location. 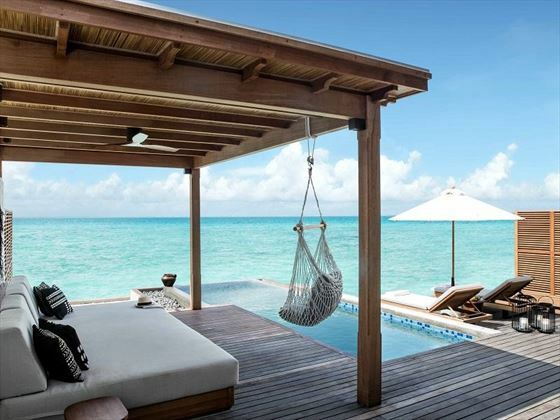 The Beach Villas are sophisticated and chic, with private plunge pools and close proximity to the water’s edge. 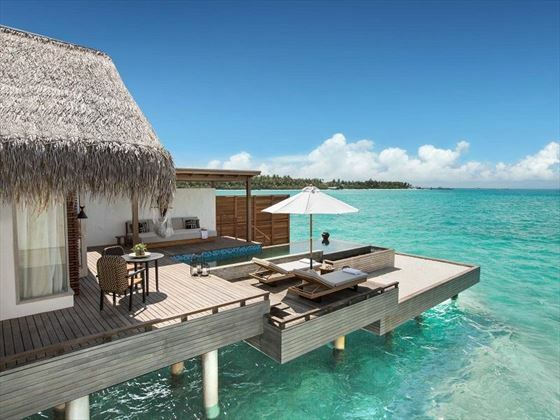 Meanwhile, the Water Villas perched above the lagoon boast spacious relaxation decks for enjoying stunning sunrise and sunset views. 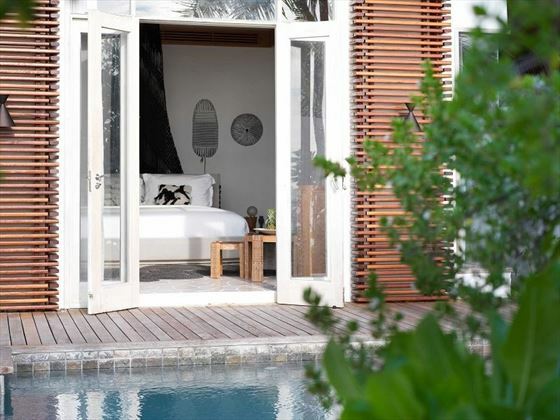 For your piece of the Maldivian wilderness, we’d suggest opting for the Tented Jungle Villa, surrounded by tropical flora for an even more private experience. Fine-dining is a paramount part of this exclusive island experience. Wander along to Raha Market for your taste of authentic Maldivian cuisine, or treat yourself to dinner at the signature waterfront restaurant Kata, serving sensational Japanese cuisine. If you don’t want to leave the comfort of your suite, you can opt for an in-villa dining experience, with a first-class chef cooking a delicious BBQ right in front of you. Sea kayaking, diving and catamaran cruises allow you to explore the enticing turquoise lagoon, or you could discover Jason deCaires Taylor’s Coralarium – the world’s first semi-submerged art space. The Willow Stream Spa offers wonderful treatments inspired by the elements of earth, fire, water and air for those hoping for a more relaxing afternoon. 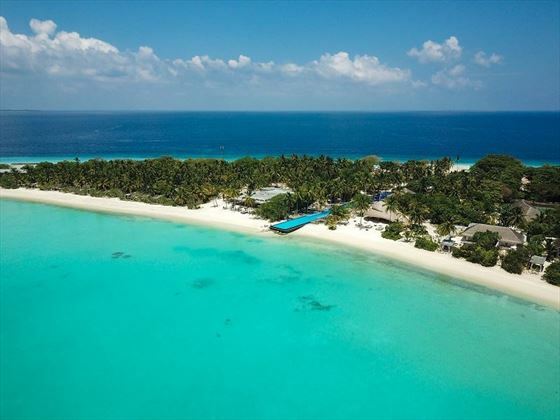 This Maldivian retreat has one of the most naturally beautiful and remote locations. 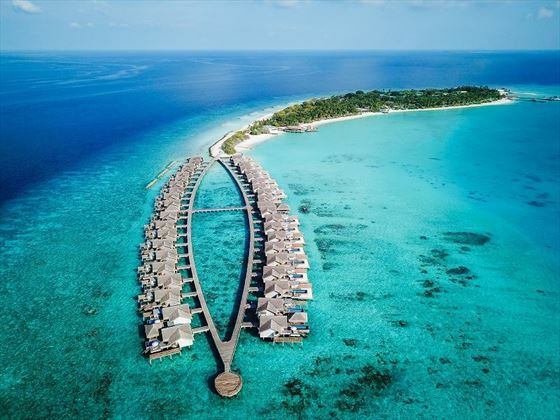 Nestled on the Maldives’ most exclusive island, Sirru Fen Fushi, you’ll be taken aback by the glorious white sands and turquoise lagoon surrounding your secluded villa. Known as ‘Secret Water Island’, it’s the perfect location for experiencing that desired castaway feel. Beach Villas – With glistening white sands and the Indian Ocean right in front of you, these villas feel like a beachside paradise. 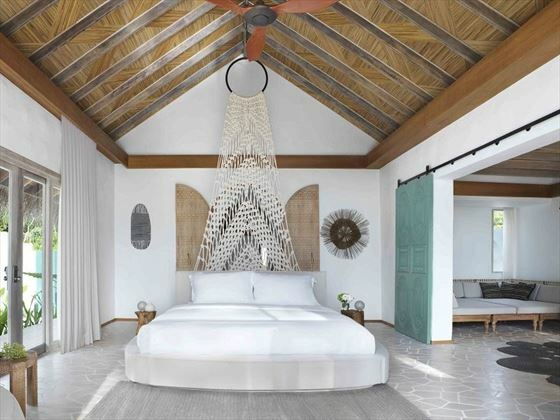 Boasting indoor and outdoor bathrooms, a relaxation sala, and a plunge pool. Choose from a Beach Sunrise Villa, Deluxe Beach Sunrise/Sunset Villa, Two and Three-Bedroom Beach Sunset Villa, or a Five and Seven-Bedroom Sunset Villa. 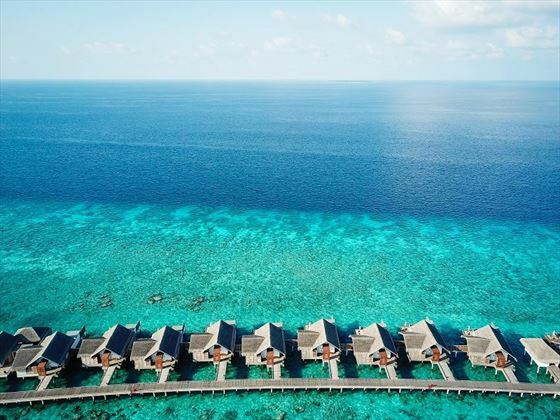 Water Villas – Serene and relaxing, these gorgeous villas sit above the tranquil lagoon, featuring an oversize copper bathtub, a relaxation deck and sala, and a plunge pool. 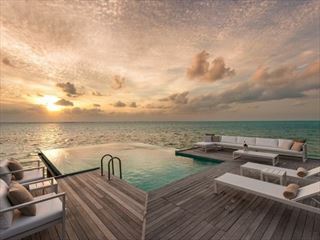 Choose from Water Sunrise Villa, Grand Water Sunset Villa, Two-Bedroom Water Sunrise/Sunset Villa, and a Three-Bedroom Water Villa. 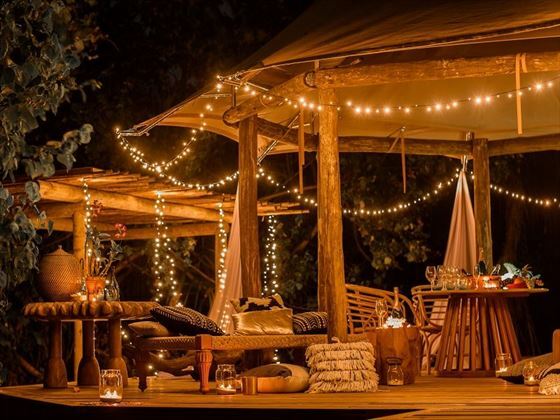 Tented Jungle Villas – Gorgeous and remote tented villas, surrounded by luscious tropical flora yet still so close to the beach’s sugary sands. 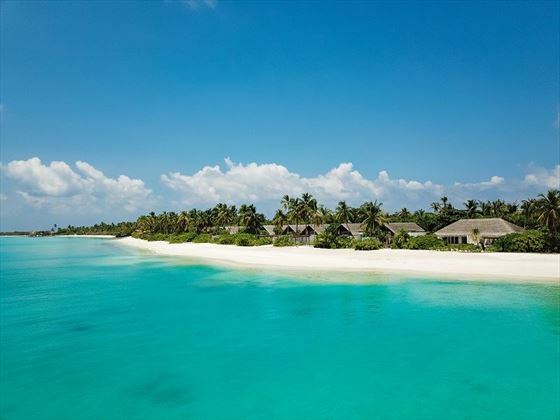 The perfect way to immerse yourself in the Maldivian wilderness. Featuring an outdoor shower, children’s bedrooms, a relaxation sala, and a private garden with a pool. In-Villa Dining – If you’re hoping for a private dining experience in the comfort of your dinner, you can arrange for a chef to come and create a BBQ for you right before your eyes. Raha Market – A vibrant marketplace serving rich traditional Maldivian cuisine, as well as a myriad of Asian favourites. Azure – A picturesque seaside restaurant, boasting deliciously fresh seafood and a first-class wine list. Enjoy divine delicacies whilst looking out onto the lagoon. Kata – A sleek Japanese restaurant right on the waterfront. 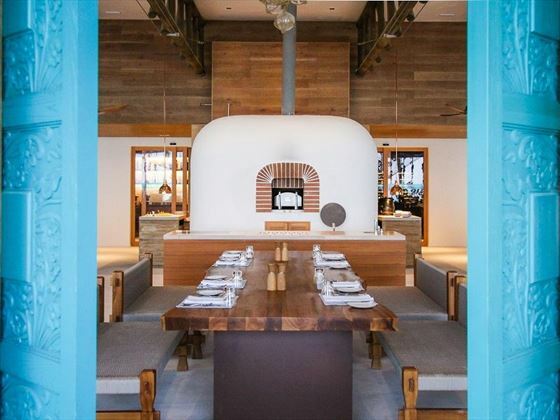 As the resort’s signature restaurant, the cuisine is second-to-none, boasting a menu filled with contemporary Japanese dishes, robatayaki, and inventive cocktails. There’s also a rooftop lounge ideal for watching the sunset. Onu Onu – A laidback poolside bar created with bamboo, serving innovative and classic cocktails alongside tasty light bites. The Willow Stream Spa is a peaceful retreat, inspired by the elements of earth, fire, air and water. 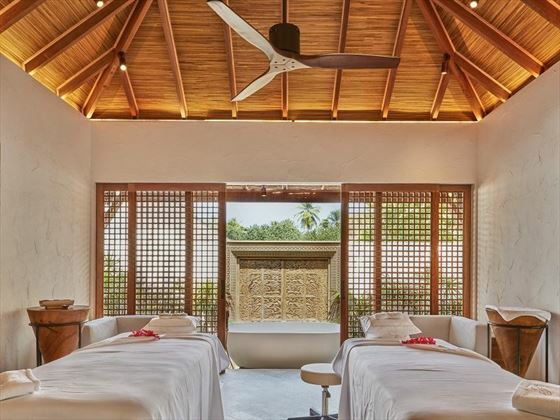 Treat yourself to a calming massage, facial or scrub in one of the outdoor treatment rooms, before sinking into the serenity pool and truly unwinding. Please note that check in or out is not permitted on 31st December or 1st Janauary each year.